Nonprofits must do it all while managing staff, volunteers, time and resources. So you don’t have to spend time searching the internet, CFT has gathered a few key resources together to assist nonprofit professionals. You can apply for a grant from CFT through our general Letter of Inquiry (LOI) process, and our Community Impact Grant and Caruth Fund Grant applications. Click here to learn more. You can find additional opportunities for funding through our online Giving Guide. You can partner with CFT for Business and access the services and programs designed to engage nonprofits with North Texas businesses. If you are applying to one of these foundations during their regular grant process, please use their suggested format/method of submission. Information on how to apply to each partnering foundation can be found on their individual websites. As one of the nation's leading management support organizations, the Center for Nonprofit Management brings the most current tools for best practices in nonprofit management to thousands of local nonprofit boards, staff and volunteers each year. The center’s mission is to strengthen nonprofits to enhance sustainability and maximize impact. The Volunteer Center of North Texas (VCNT) is one of the largest and most active volunteer centers in the country. 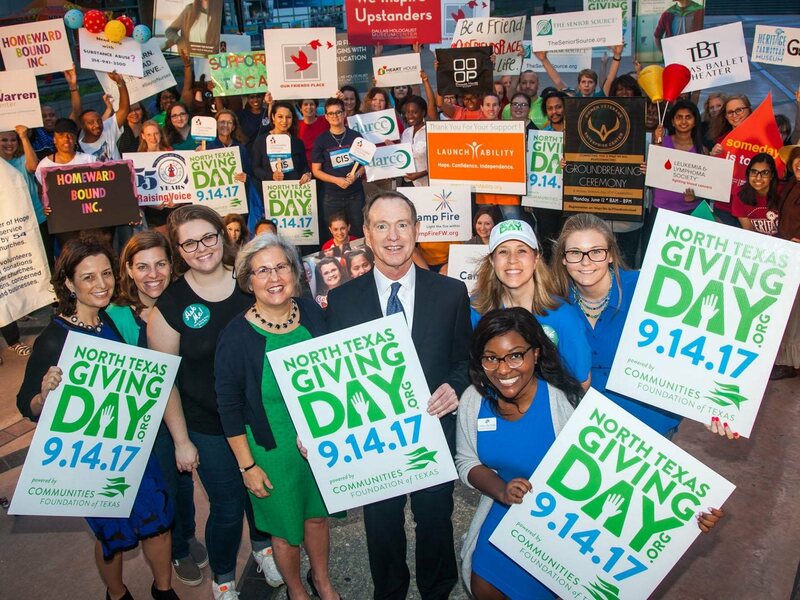 The primary purpose of the VCNT is to recruit volunteers, including individuals, corporations and civic and faith-based groups, to serve at more than 2,500 nonprofits throughout North Texas. The Association of Fundraising Professionals (AFP) represents 25,000 members in 165 chapters in the United States, Canada and Mexico, working to advance philanthropy through advocacy, research, education and certification programs. AFP provides training opportunities for fundraising professionals and promotes public understanding of philanthropy and philanthropic fundraising. Dallas Black Dance Theatre, the premier professional dance company in Dallas, has taken steps to secure its financial future. In 2008, Dallas Black Dance Theatre successfully completed a $10.8 million capital campaign to secure a permanent home and established a fund with Communities Foundation of Texas to make continued giving easy for donors. Nonprofits strengthen our community and having a great community doesn’t just happen. Communities Foundation of Texas is committed to helping nonprofits thrive.